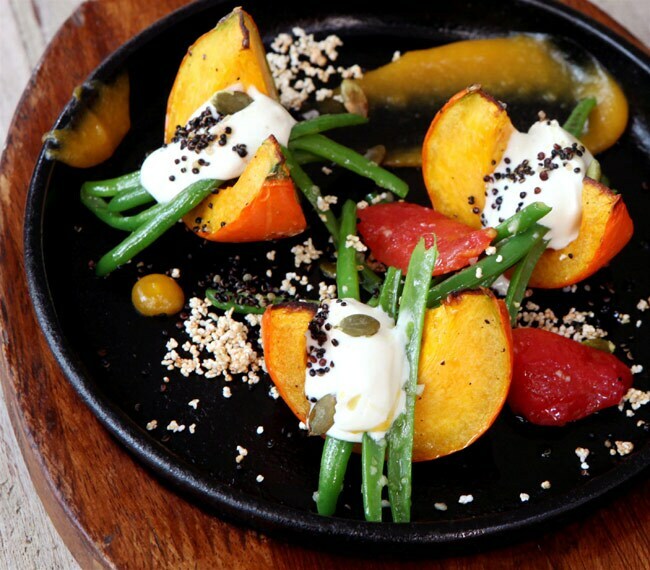 The new winter menu at Olive Bar and Kitchen, Mehrauli will stir your taste buds and satiate your soul! Food during winters isn't about spice; it is liked rather subtle and nice. On a cold Sunday afternoon, there is nothing better than a delectable brunch menu with a glass (or more!) of red wine. With this precise thought in mind, I sauntered in at Olive Bar and Kitchen, Mehrauli on a warm Saturday afternoon (Yes, I have the day off from work, every weekend!) with a friend. I have been a self-admitted Olive fan and she was a first-timer. And both of us had massive expectations (naturally!) from the restaurant's new winter menu designed by the restaurant's new Chef de Cuisine Sujan S. Did it turn out to be one gastronomically delightful experience? Hell yeah! As a foodie, I like surprises. Either in the flavor, ingredients or presentation! And the new menu won me over on all three accounts. There's a lot here to marvel at! Many of the ingredients don't sound too appetising when you first hear/read them but give them a shot and you'll know exactly what the chef had in mind for you. My meal began with the delightfully original wild mushroom tortellini which pretty much set the tone for how delectable the entire experience was going to be for me. 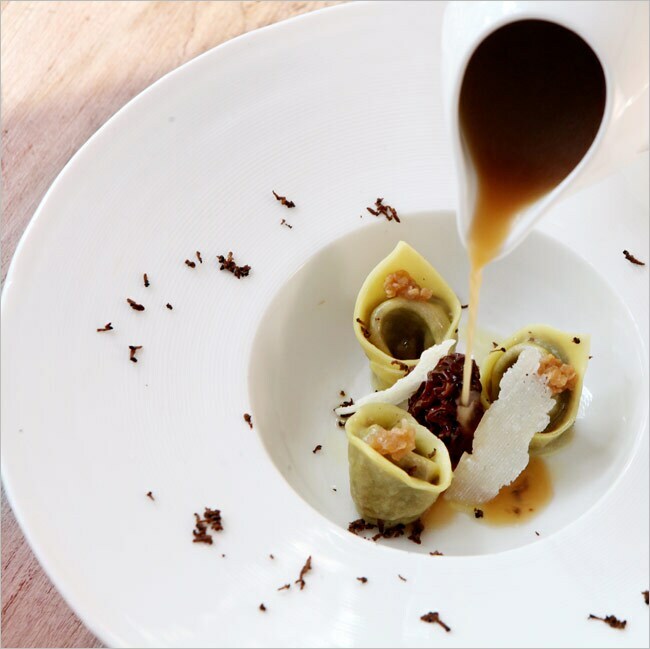 With stuffed morel, mushroom consommÃ© and winter truffle, this is highly recommended. 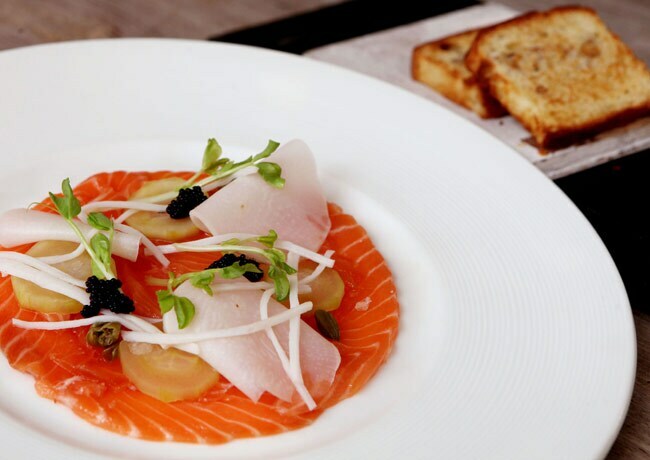 The home cured salmon is another interesting starter option for lovers of fish. It's got crab, pickled cucumber and turnip, caviar and toasted brioche. For vegetarians, the deep fried brie with marinated beetroot and mandarin is a sure-shot winner. What I loved most about this dish? The pine nuts! One of the highlights of my meal was the baby pumpkin salad. I'm no big fan of the pumpkin and honestly, was rather skeptical about this one. Who likes to eat pumpkin at a fancy restaurant anyway, right? You'll change your mind for sure after trying this salad out. Special brownie points to the chef for using quinoa as an ingredient here! And if you're still not convinced about the pumpkin bit, there's always Olive's signature tuna nicoise to opt for. This one has quail eggs, kalamata, green beans and semi dried tomatoes to please. When my lime and green apple sorbet arrived on the table, I knew it was time for the main course to come. On a side note, this palette cleanser is so good; I highly recommend it being served as a proper dish in the menu. My friend was clearly in the mood for more of it! Considering the restaurant has different lunch and dinner menus, I'd asked to be served a bit from both. The chef while chatting with me in the beginning even suggested staying away from the pastas and pizzas, not coz they aren't tasty enough (Duh!) but to try out a variety of other things we Indians tend to ignore. To think of it, isn't he absolutely correct? Pizza and pasta is all that most average Indians have in the name of food experimentation anyway! My main course began with pan fried lemon sole along with caper butter. I'll admit I didn't care much for the sole but the caper butter had me hooked like how. The grilled vegetable and ricotta pinwheel was healthy, light and flavorful. You could actually taste the distinct flavor of every vegetable without one single one overpowering the other. 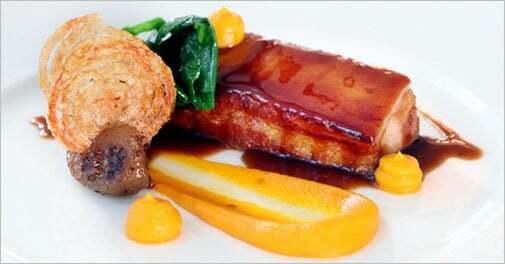 Slow braised pork belly had me excited on arrival but didn't live up to the expectations. I've tasted much better ones at other places and would advice you stay away from it. It just wasn't soft enough! 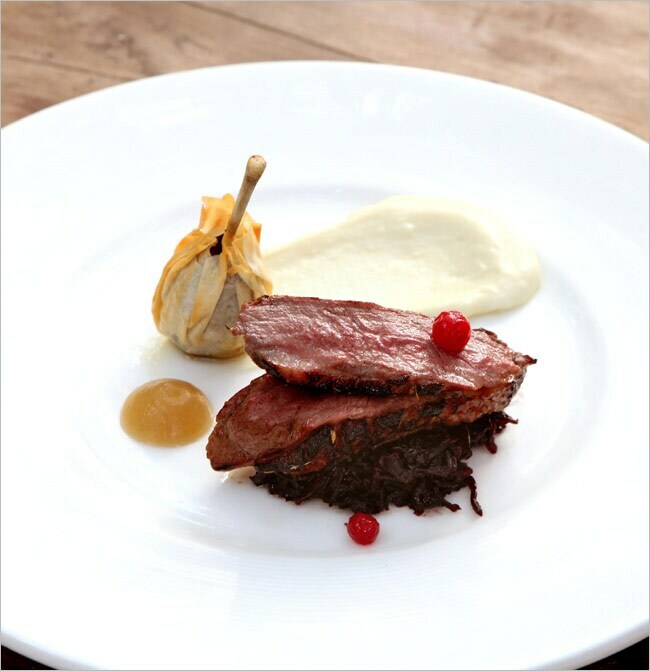 Instead try the honey and fennel glazed duck breast. Its vanilla potato puree flavor is different, tantalizing and a remarkable innovation. For dessert, I was served dark chocolate fondant with vanilla ice cream and strawberry mille feuille. While the dark chocolate fondant was expectedly good (when is dark chocolate bad anyway? ), it was the mille feuille that surprised. I generally don't like the strawberry flavor; it is just too sweet for me. But this moose and sorbet combo is a certified winner. Having done quite a few food reviews before, I must mention that the experience mostly leaves you feeling stuffy and bloated. Too much food, you'd say? 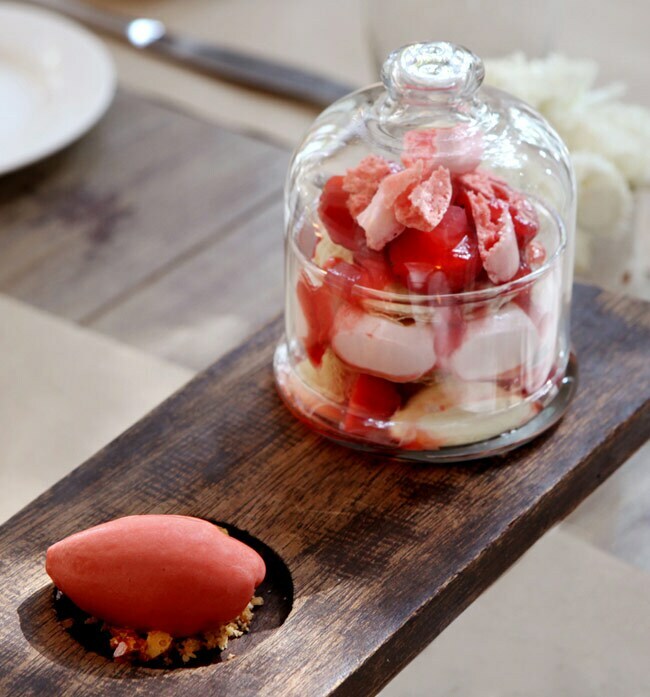 It is also about the heavy flavors and preparation that most places indulge in. But my lunch at Olive didn't turn out this way. I felt light and satiated, never feeling the guilt of having eaten too much. The flavors were easy on the stomach, something very important for a winter menu to have. Like I've said earlier, I've been a fan of Olive for quite a while. But this new menu has certainly got me excited. I'm definitely coming back, Chef!